The Marriott Fallsview Hotel & Spa is a world-class Niagara Falls hotel that is home to an exciting range of unique dining experiences which you won’t find anywhere else. Indulge in succulent steaks, fresh seafood, burgers, salads, and more at Morton’s Grille Niagara Falls, fresh and delicious breakfast at Terrapin Café Breakfast Buffet and Starbucks, or classic favourites like hamburgers, sandwiches, salads, and desserts in the hotel’s Lobby Lounge. At the Marriott Fallsview Hotel & Spa, providing guests with the best views of the Falls is always of paramount importance, which is why each of the hotel’s food and dining destinations is located on the Fallsview side of the hotel, overlooking the Canadian Horseshoe Falls. Morton’s Grille Niagara Falls is Canada’s first and only Morton’s Grille restaurant, offering a casual yet elegant atmosphere along with an impressive menu of succulent steaks, fresh seafood, burgers, salads, and more. Morton’s Grille Niagara Falls also offers enticing hand-crafted cocktails, an impressive wine list, and unrivaled service for amazing dining experiences in view of one of the world’s most beautiful natural wonders. Sit back and relax in a casual Fallsview spot at the hotel’s wonderful Lobby Lounge. 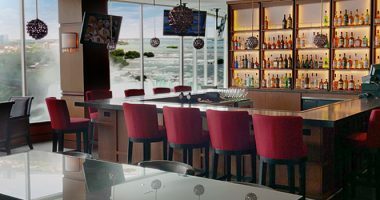 Whether you want to catch up on the world news or watch an exciting game, the Lobby Lounge is a great place to visit as it features a number of large flat screen TVs, comfortable seating, and an impressive food menu. Enjoy favourites like hamburgers, salads, sandwiches, nachos, and pizza for a casual and delicious meal right in the hotel’s lobby. 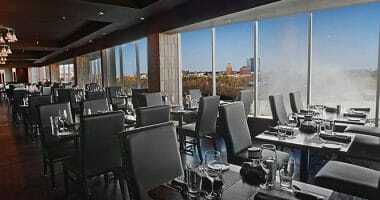 Milestones on the Falls offers inspired food, inspired views, and Fallsview dining at its very best. Located on the mezzanine level of the Marriott on the Falls hotel, Milestones on the Falls restaurant is open daily for lunch and dinner and directly overlooks the Horseshoe Falls. Stop for a delicious coffee or light snack on the go at the Starbucks Cafe located inside the lobby of the Marriott Fallsview Hotel & Spa. 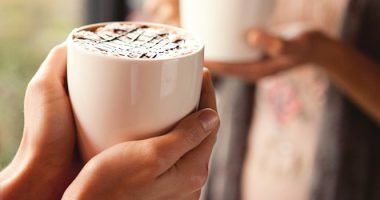 Starbucks offers a wide assortment of classic coffee and specialty drinks alongside fresh and delicious food to connect you with amazing cafe experiences in a convenient Niagara Falls location. 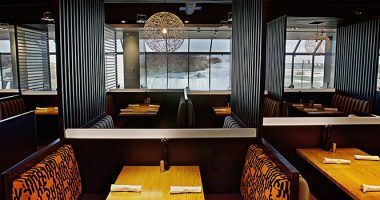 Located on the Marriott Fallsview hotel’s mezzanine level, the Terrapin Cafe offers a spectacular à la carte and hot buffet breakfast menu with an equally spectacular view of Niagara Falls. 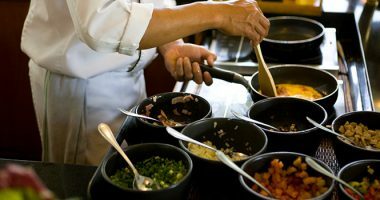 The hot buffet features an omelette station, fresh pastries, fruit, cold cereal, yoghurt, bottomless coffee, juice, and more, and will help you start your day off right while visiting Niagara Falls.